With all that in mind, I decided to build a little sample app to test out some of the features. Before you get started you will want to download the Visual Studio plugin to help with the development of your app. Also I recommend having a read through the TypeScript spec which has a wealth of information on what features the language offers. The app I decided to build was a little code cracker which is based on a Genetic Algorithm. This is not a very advanced implementation of GA as the fitness function and mutations are not very sophisticated. However is does give me the level of complexity I needed to test the language out. In my app I wanted a simple ui where someone could enter a numeric code of 50 chars which I would then attempt to crack. Using a population of random keys to start with, each key’s fitness needs to be tested against the crack key, the strongest key based on fitness is the only survivor and its DNA becomes the basis for the next generation. Each generation has a mutation factor of 10% which ensures that the key should evolve over time an eventually the 50 char crack key will be found. Below is an example of my UI and my typescript code to run the algorithm. In TypeScript the designers have set about designing a language that they hope will fall inline with the emerging ECMAScript 6 standards. While there are no guarantees, I think this is a good strategy and one that shows their willingness to make TypeScript the most open of all the higher level browser languages. To support hierarchical namespaces in the language developers can use modules which allow classes and interfaces to be grouped under a logical area. 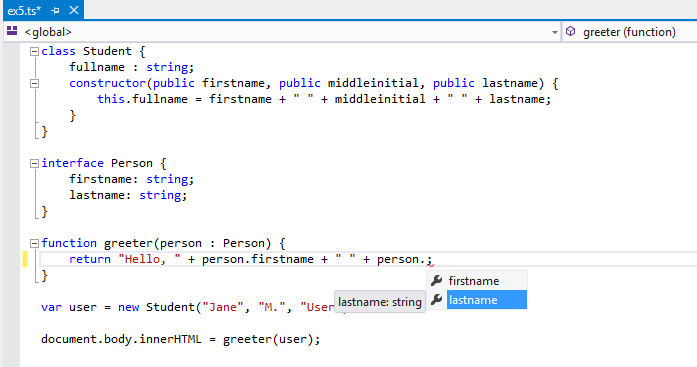 In my sample I created a fake namespace using dot notation which TypeScript supports. One cool thing to note about modules is that you can define them across files, and the TypeScript compiler is smart enough to locate them all and show all your classes in the visual studio intellisense. time / 1000 + " seconds to decrypt the key. Generation Count: "
The language often feels like a blend of C# and Visual Basic. Little things crop up as you work with the language such as the way the “var” keyword behaves, mimicking the c# one with type inference. Also it helps that all the curly braces are in all the right places which is what you would expect from a c-based language. “Implements” for example is the keyword you use to inherit an interface which can map back to Visual Basic. Best of all however is that “Fat Arrow” “() =>” is supported so you can avoid the verbosity of “function”. I wonder if the design team made a conscious effort to do this or if it just naturally fell out. That’s said however, there are obviously enough differences to make TypeScript distinctly separate from both C# & VB. Overall I found using TypeScript extremely satisfying and I am excited as to what the future hold for the language. We already know that they intend to support Generics. But long term could we see statically typed versions of LINQ, RX etc. Also the tooling I can see coming on leaps and bounds. I have already heard mutterings on twitter of TypeScript support from JetBrains which would be awesome! ← Windows phone 8 to support chat rooms? Excellent stuff Dave. Thanks for taking the time to write it up so thoroughly. Cheers man. Typescript is awesome. Try it if you haven’t.